Finding the information you need is now easier than ever. 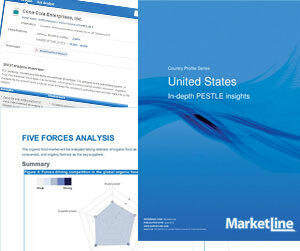 MarketLine individual reports & profiles are an ideal source for building your knowledge of all major companies, industries and countries across the world in the form of our SWOT profiles, industry profiles, industry guides, company focused case studies and PESTLE country profiles. Many of our reports & profiles can be purchased from our online store, however as a MarketLine Advantage subscriber you get unlimited access to our entire product portfolio which includes access to 30,000+ company profiles, 4,000 industry profiles spanning 215+ countries worldwide. As a subscriber to Advantage you will also have access to exclusive subscriber content. As a MarketLine Advantage subscriber, you get exclusive access to additional company information. Assess business opportunities beyond national borders with insight into regional industries. Get a complete overview of sectors and their geographic context in a single convenient summary. Country Statistics identifies and contextualizes key country and market trends – both historically and into the future. Scan and compare over half a million data points for 215 countries and 46 political and geographic groupings. As a MarketLine Advantage subscriber, you get exclusive access to our Country Statistics Database.